Dutch artist Lizan Freijsen explores our relationship to fungi, stains, mold, and moisture through modes of interior design. Freijsen creates rugs (as well as wallpapers and blankets) that mimic the unique patterns of natural formations in states of growth and decay. Each carpet has its own shape and color palette, and is comprised of concentric rings—some with eccentrically squiggling edges and others with more simple circles. To produce these often large-scale textiles, Freijsen partners with Hester Onijs and Karen Zeedijk at the Textile Museum in Tilburg, NL. In addition to her own art practice, Freijsen has been teaching at the Willem De Kooning Academy in Rotterdam since 2000. You can see more of her work and peruse rugs that are available for purchase on her website. “Santa Cruz River” (2016-2017), Textile tapestry (handtuft system), wool, 980 x 420 cm, Courtesy of The National Gallery of Victoria. “No Longer Creek” (2016), Textile tapestry (handtuft system), wool, 820 x 460 cm, Presented at Design Miami/ Basel, 2016 | Basel, Switzerland. Commissioned by Artsy. Courtesy of Artsy & The National Gallery of Victoria. Dutch art trio We Make Carpets (previously) formed their first temporary tapestry in 2009 from collected pine cones and needles, which they appropriated titled Forest Carpet. For almost a decade since, the collective has been working with ordinary materials to create visually seductive “carpets” arranged on the floor or presented vertically on the wall. Last year they were asked to create six new works and five interactive installations for a solo exhibition at the inaugural National Gallery of Victoria Triennial in Melbourne titled Hands On. Carpets were formed from child-friendly materials such as pool noodles and velcro, which invited visitors to create their own patterns from the provided objects. Hands On just concluded a second run on September 9 at the National Gallery Singapore. You can take a look inside the making of a recent site-specific installation for The Moody Center for the Arts at Rice University in Houston in the video below, and see a more extensive collection of their temporary carpets on their website and Instagram. Portuguese textile artist Vanessa Barragão produces carpets and tapestries from a variety of different techniques, creating multi-faceted landscapes with the use of latch hooking, crochet, weaving, basketry, and felt. 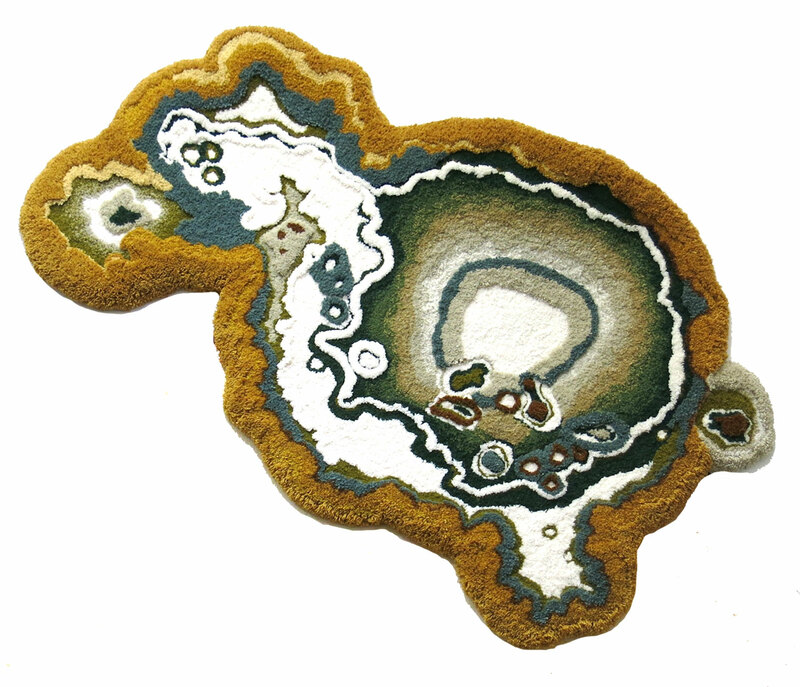 Her environmental works present imitation coral, fungi, and algae as three-dimensional elements in plush contexts such as the circular work viewed above which she calls Earth Rug. The piece was developed for this year’s Milan Design Week and spans nearly 15 feet in diameter. With a steady hand and several fine-point brushes, Miami-based artist Jason Seife (previously) produces paintings that mimic the ornate patterns found in Persian carpets. Seife presents the same geometric symmetry seen in historic designs, yet takes his own liberties with the colors of ink and acrylic paint chosen for each work. The vibrant hues selected are not ones traditionally found in Persian textiles, but are his way to imbue his own state of mind into each piece. Argentinean artist Alexandra Kehayoglou (previously) produces handmade wool rugs that appear like aerial snapshots of dreamy pastoral landscapes. Mimicking lush environments filled with trees and moss, her hand-tufted works can take up to several months to complete depending on size. One of her most recent pieces is a carpeted runway for designer Dries Van Noten made in collaboration with artist Danish artist Olafur Eliasson. Another piece, titled No Longer Creek and curated by Artsy, was included at this year’s Design Miami/ Basel from June 14-20. You can take a look at more of Kehayoglou’s tufted wool landscapes on Instagram, Artsy, and on her website.